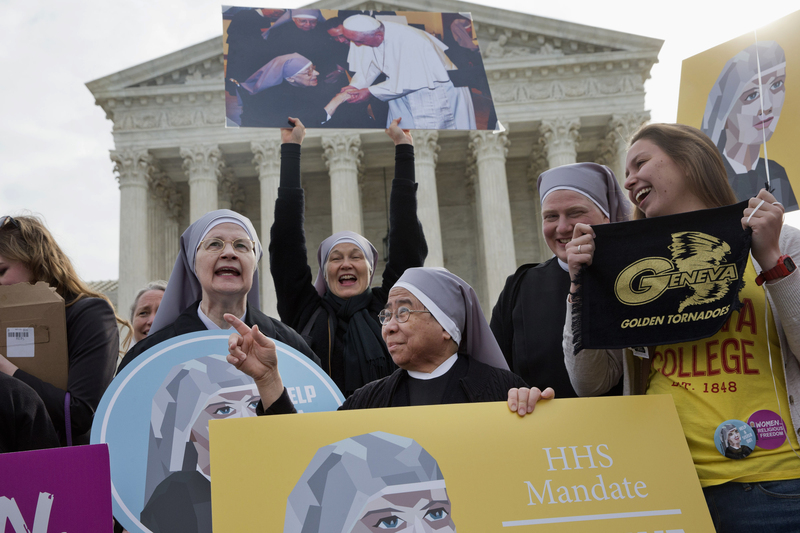 The Supreme Court seems deeply divided over the arrangement devised by the Obama administration to spare faith-based groups from having to pay for birth control for women covered under their health plans. The court's conservative justices sounded supportive Wednesday of the groups' complaint that the administration's effort violates their religious rights. The four liberal justices seem likely to vote to uphold the accommodation offered to faith-based colleges, charities and advocacy groups. A 4-4 tie would uphold four appeals court rulings in favor of the administration. But different rules would apply in parts of the country in which another appeals court has sided with the challengers. Wednesday was the sixth anniversary of President Barack Obama's health care overhaul; the case in front of the justices was the law's fourth Supreme Court appearance in five years. The issue this time is the arrangement the administration devised to make sure that religiously oriented groups do not have to pay for or arrange the provision of contraceptives to which they object, while ensuring that women covered under their health plans still can obtain birth control. Chief Justice John Roberts and Justices Samuel Alito and Anthony Kennedy voiced sympathy for the groups' claim that they remain complicit in providing morally objectionable contraceptives under the government's plan. "Hijacking. It seems to me that's an accurate description of what the government wants to do," Roberts said. Kennedy also used that word during 90 minutes of crisp arguments and frequent interruptions by the justices. Only Justice Clarence Thomas asked no questions, but he has repeatedly sided with the health law's challengers. Justice Sonia Sotomayor said the administration's arrangement takes into account women who are covered by the affected plans and "have a real need for contraception." Justices Ruth Bader Ginsburg, Stephen Breyer and Elena Kagan also asked questions that signaled their support for the administration. Eight justices are hearing the case, following the death of Justice Antonin Scalia last month. The challengers could find it hard, without Scalia, to attract the five votes they need to prevail. Contraception is among a range of preventive services that must be provided at no extra charge under the health care law. The administration pointed to research showing that the high cost of some methods of contraception discourages women from using them. A very effective means of birth control, the intrauterine device, can cost up to $1,000. Other faith-affiliated groups that oppose some or all contraception have to tell the government or their insurers that they object. In 2014, the justices divided 5-4, with Scalia in the majority, to allow some "closely held" businesses with religious objections to refuse to pay for contraceptives for women. That case involved the Hobby Lobby chain of craft stores and other companies that said their rights were being violated under the 1993 Religious Freedom Restoration Act. The nonprofit groups are invoking the same law in asking that the government find a way that does not involve them or their insurers if it wishes to provide birth control to women covered by their health plans. Among the challengers are Bishop David Zubik, head of the Catholic Diocese in Pittsburgh; the Little Sisters of the Poor, nuns who run more than two dozen nursing homes for impoverished seniors; evangelical and Catholic colleges in Oklahoma, Pennsylvania, Texas and Washington, D.C., and the anti-abortion advocacy group Priests for Life. The groups argue that the administration already has carved out exemptions and encourages people who can't get contraceptives through their employers to use the health care exchanges that were created by the health care law and serve millions of people. The administration contends that tens of thousands of women would be disadvantaged by a ruling for the groups. The court will consider whether the accommodation offered by the administration violates the group's rights under the religious freedom law. Even if it does, the administration still could show that it has a "compelling interest" in the provision of contraception and that its plan is the most reasonable way, or "least restrictive means" of getting birth control to women covered by the groups' health plans. Nationwide, eight appeals courts, including four with decisions being challenged in the current case, have sided with the administration, and one has ruled for the groups. A 4-4 outcome would leave a mess, because different rules would apply in different parts of the country. The Supreme Court takes on cases in order to lay down uniform nationwide rules. "The nonprofit groups are invoking the same law in asking that the government find a way that does not involve them or their insurers if it wishes to provide birth control to women covered by their health plans." The accommodation found a way to provide the insurance without involving the nonprofits. It does involve "their" insurers, but they don't own those insurers. Using the possessive pronouns in that instance feels very inaccurate.